- Reports to the Assistant Food and Beverage Manager and supervises the Assistant Food Managers, Food and Beverage Management Trainee (also designated in some cruise lines as Food & Beverage Manager in Training) and Utility Supervisor. - Directly responsible for the supervision of all food production and food operation activities that take place on the cruise ship. - Ensures that superb level of food quality and services are provided to passengers while monitoring operational costs and ensuring that expenses stay within the limit set by the cruise line. - Meets the new recruits and explains the ship�s rules, regulations and onboard routines as well as briefs them on their specific duties. - Mentors, develops and provides on-the-job training to new recruits in order to improve their current performance allowing them to gain skills and abilities for future advancement. - Ensures proper appearance and grooming of all personnel within the department and notifies the Food and Beverage Manager of any poor performance and disciplinary action cases. 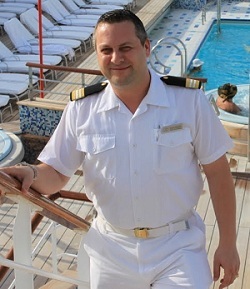 - Works in cooperation with the mid-level management of all other departments in order to coordinate all events taking place on the cruise ship where food and bar operations are involved - Captain's Welcome Parties, Sail Away Parties, Theme Nights etc. Minimum three years progressive F&B managerial experience in a hotel, resort, restaurant or cruise ship. Extensive knowledge of restaurant and food service industry. Ability to manage the financial aspects of a food and beverage operation. Excellent command of the English language (both verbal and written) required. $4100-5400 U.S. per month, depending on the cruise line, commission and size of ship. Possibilities for promotion to Assistant Food and Beverage Manager position.